NOVA graduates: Simon Simovski, attending Bard College in the US, Ljupco Naumov, attending Bocconi University in Milano, Despina Stefanoska, attending Jacobs University in Bremen and David Dlaka, attnding Oxford University in the UK, featured on Sitel TV. 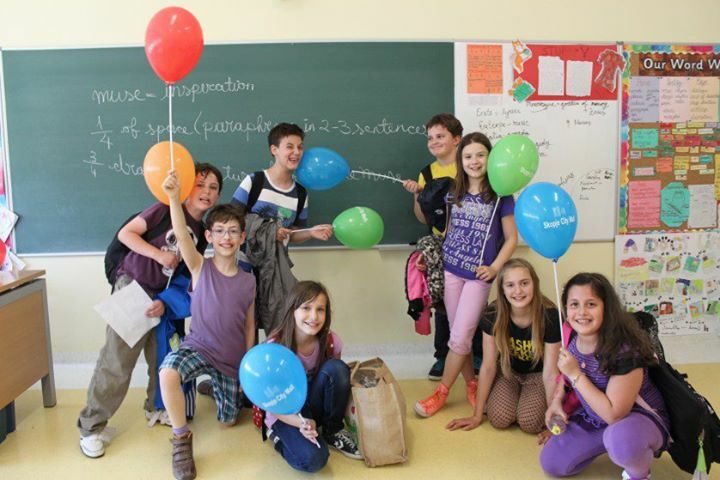 ACES (Academy of Central European School) was founded in 2006 by ERSTE Foundation in cooperation with Interkulturelles Zentrum (Vienna, Austria). In 2009, VČELÍ DOM (Bratislava, Slovak Republic) joined in the partnership. 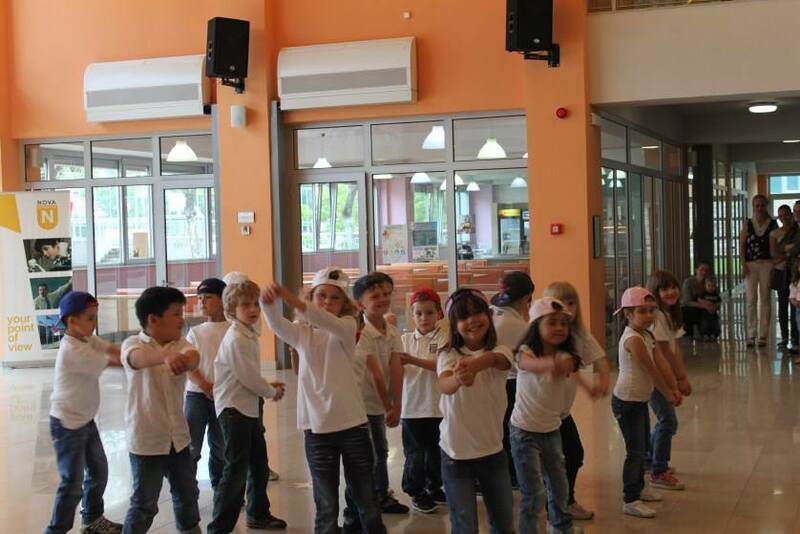 Through open calls for project proposals, every year ACES encourages partnership projects among schools in Central and South Eastern European countries. 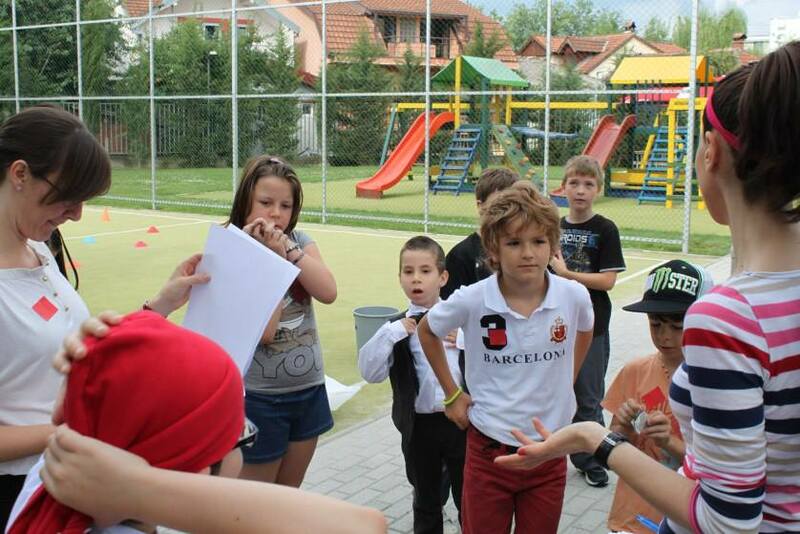 The overall theme of the ACES call for 2013 is “I and the others: Discovering diversity around and within me” This year NOVA International School partnered with the Colegiul National “Gheorghe Sincai” from Bucharest, Romania and submitted the project proposal named “The More the Merrier (theater play)”. The idea of this project is to have a group of students from both partnering schools work together on preparing, rehearsing, and performing one joint theater play that will illustrate the life of a diverse group of people, represented in our communities, and the difficulties they are facing. There were 217 eligible project proposals for this year's open call and the ACES international selection committee decided that our project deserves to be selected among the 44 awarded projects that will be financially supported. Moreover NOVA teachers and students will have an opportunity to participate on the ACES Kick Off meeting in Bucharest, Romania and ACES Academy in Senec, Slovakia. 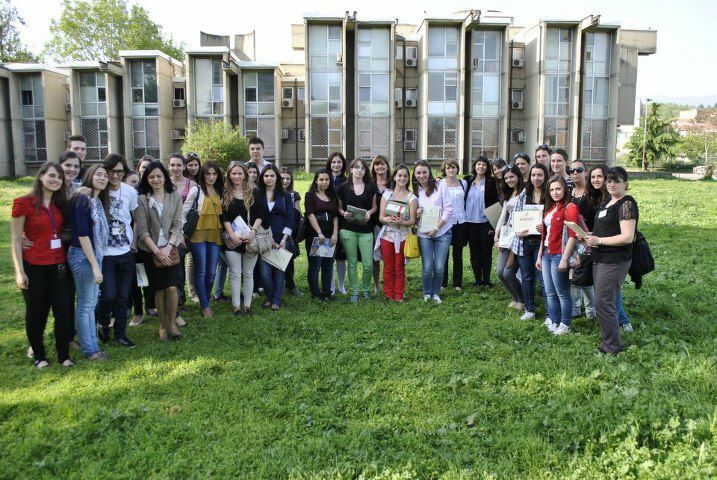 After ACES supported NOVA and two other schools from Tirana, Albania and Silistra, Bulgaria in 2011/2012 with theproject “Volunteering Club 365", this will be NOVA's second awarded project in the last three years. We are all looking forwards to providing our students with an excellent opportunity for an international experience and joint work on a project with their peers from Romania. For more information you can visit the ACES webpage: http://www.aces.or.at. Students from Pre Kindergarten through 4th grade sang and danced in our End of Year Celebration with energy and sheer joy. It was also a time to thank all our teachers for their dedication and hard work. It was a great conclusion to a great year! Our last full day of school was FunDay – the entire time was filled with games, awards, and ice cream! It was a super reward for all the student’s hard work. 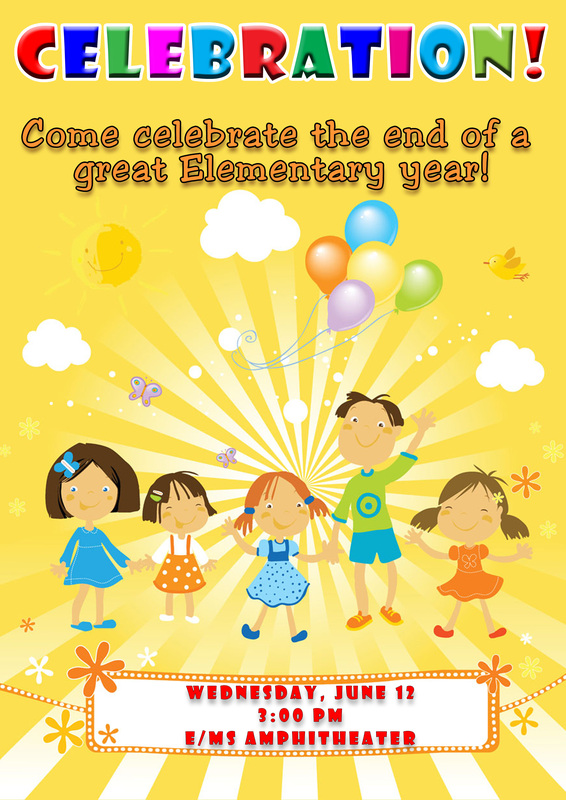 In order for children to have a more active summer vacation, NOVA organizes a Summer School and Summer Camp from June 17 until July 5, 2013. 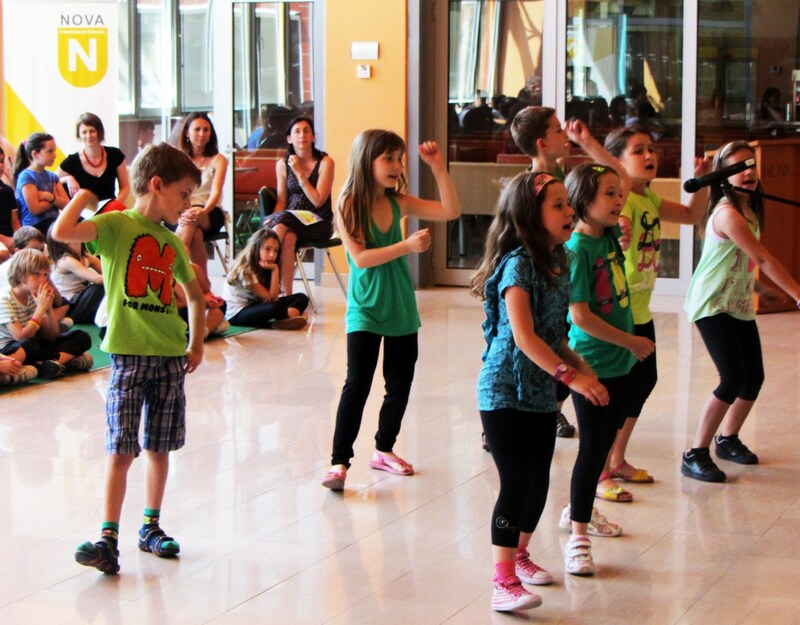 For further information and application materials, you can visit the following link: http://nova.edu.mk/life_at_nova/summer_camp_and_school.aspx or contact us by phone: (02) 3061-807 ext. 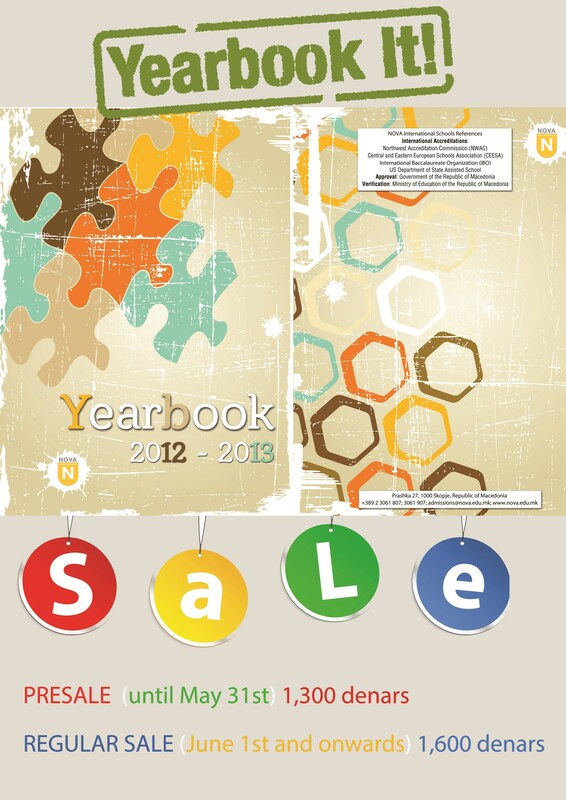 201 or e-mail: primary@nova.edu.mk. All interested families will be given a tour of the facilities at a previously scheduled time . Last month we learned about probably one of the most difficult character traits to master – PATIENCE. Now we’re getting better at listening quietly and waiting our turn. 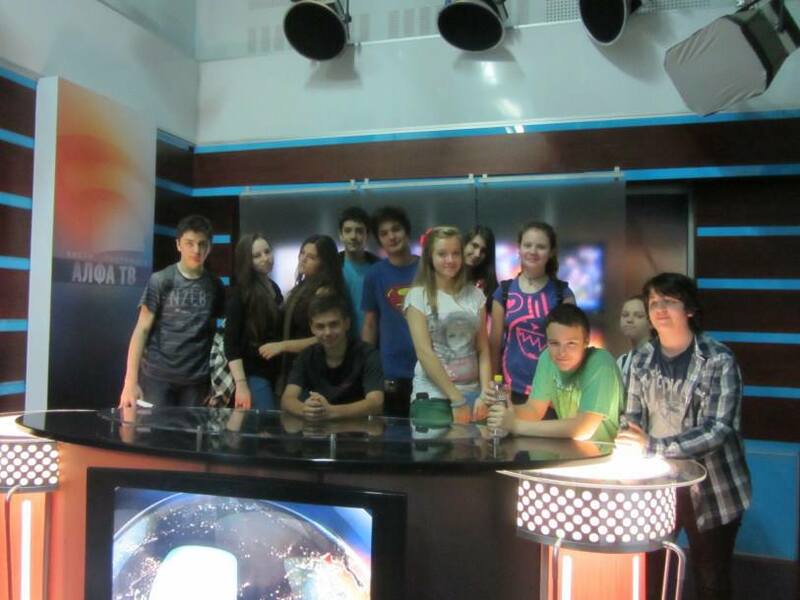 As part of their media education in Macedonian language classes, 8th grade students were supposed to visit one TV station. For this purpose, we went to Alfa TV and were able to see the inner workings of a TV station. From how a live show is produced to how the news and and the station are run, we were backstage, talking to journalists, directors and other members of the crew. The most interesting place for the students was the digital studio where all programs are actually custom made – by cutting and pasting parts of "films", performed by a specialized editing software, all with the purpose of making a perfect TV show. The students realized how much effort, time and resources are needed even for something as "simple" as a single minute "on the air"! We truly enjoyed our visit! On May 22nd, the Macedonian Association of Ron BrownAlumni (MARBA), with support of the Embassy of the United States ofAmerica in Skopje, organized the second training session of the LeadershipSeries Lectures, focusing on Project Management and conductingProduction Simulation.These trainings are conducted by Ron Brown Alumni, targeting youth aged between 14 and 24, and involving topics related to entrepreneurshipand ethical leadership.Following the Basics of Project Management training, 12 students participated in the Production simulation. TheSimulation itself is a complex exercise, which treats all main aspectsof a small manufacturing enterprise: forecasting, planning, organisingand managing, manufacturing, marketing, negotiating, controlling, andfinancing, as well as team work and leadership.According the participants, it was an enjoyable learning experience. A short while ago, several NOVA students were given the opportunity to attend the official premiere of the new Volvo FH Truck. As a matter of fact, it came as somewhat of a surprise to the few of us that had been selected to be some of the very first in this country to hop in Volvo's newest creation.It was April the 26, the sun was up, and we were at a parking lot hosting the brand new truck model. However, weren't there to get driven around. A task was given to us: remain in the cabin, note all it offers and assess how comfortable would it be to spend long hours, even days in it, while traveling through a wide range of climates and weather conditions and encountering various issues on the road.We tested the new modern features and the smartly designed setup of instruments, tools, storage spaces, resting spaces and useful appliances and features, the finest details of which the Volvo " special agents" were very patient to carefully present to us. Another aspect explained was the practicality of the new driver's dashboard, equipped with the top sensors and gadgets monitoring the state of the vehicle, which provides the driver constant information to assure that no potential trouble is caused due to irregularities, (like for example, engine overheating) . After all, the Volvo representatives did say that safety is the most important variable taken into consideration when creating their vehicles.The happening was also interesting for reasons other than the experience of seeing all the innovative features of a machine considered as ordinary as a truck. (We were also amazed to discover that that the cabin of the truck, which appeared to be quite ordinary, containing two beds, a TV and refrigerator, can, if stacked properly, house exactly 39 adult men!) The official premiere itself was rather engaging, giving us a glimpse in the world of promoting events of big corporations, such as Volvo. The five of us, who were sent on the "secret mission" with a code name “Icon reborn” were invited on the stage to share our impressions. As students, we were the youngest there, and perhaps the big stage and extraordinary buffet was not something we would immediately connect with trucks and drivers. 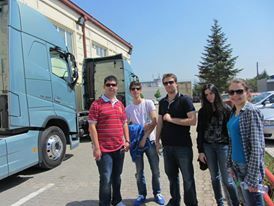 However, the premiere of Volvo FH proved to be great fun and quite a fascinating learning experience. We really hope we get to participate in something similar again. 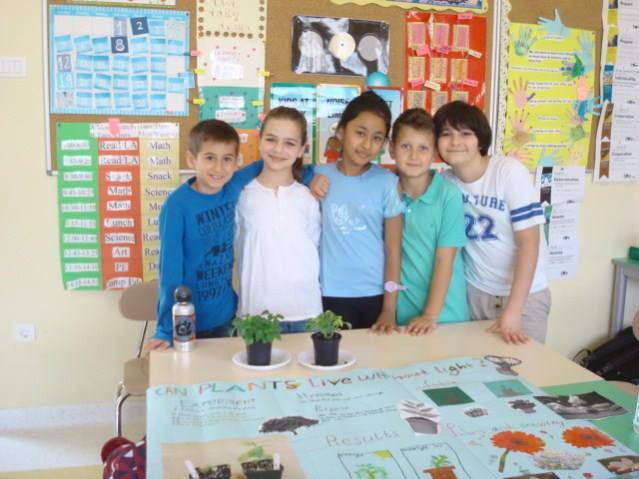 Our students became young physicists, zoologists, nutritionists, environmentalists and sound engineers by asking questions and then conducting experiments and doing research to find the answers. Some of the questions were: Why do these animals have different kinds of skin? What is a healthy breakfast and why? What could I do if I were an electromagnet? Why do we need light to see? How does insulation affect heat? 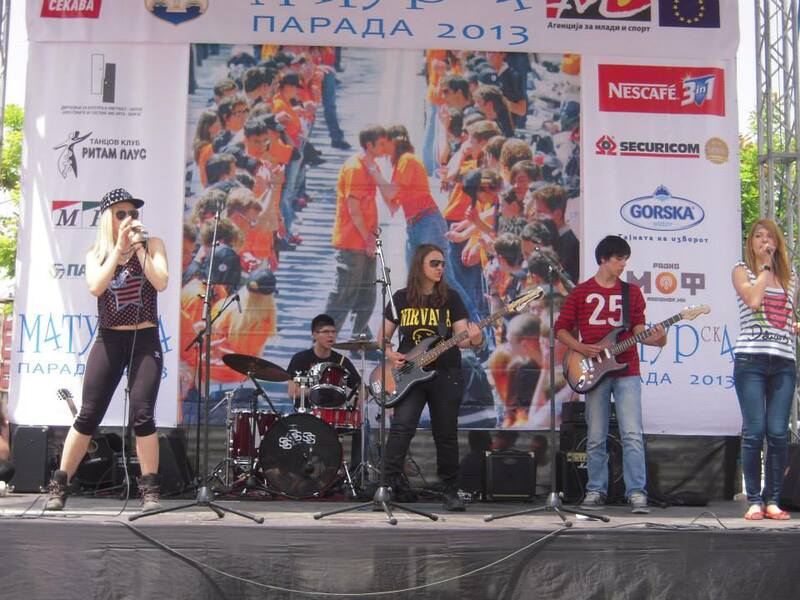 We are very happy to announce that our HS Band members rocked the stage on Macedonia square today, May 17th. They took part in the largest gathering of high school seniors in Skopje ever, as part of the Macedonian Senior Parade. Well done, guys! 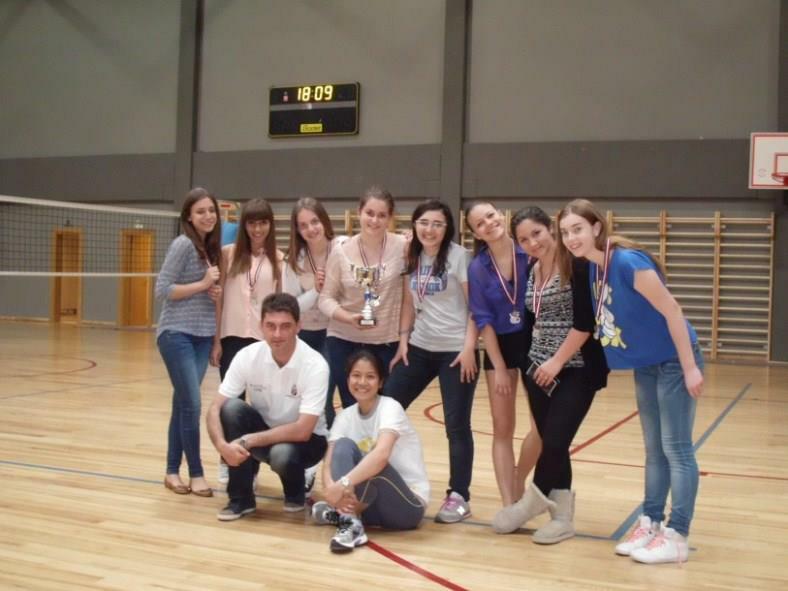 Our high school girls volleyball team is participating in a CEESA tournament hosted by the International School of Belgrade. The will live stream the volleyball games on 2 separate channels on Friday and Saturday. 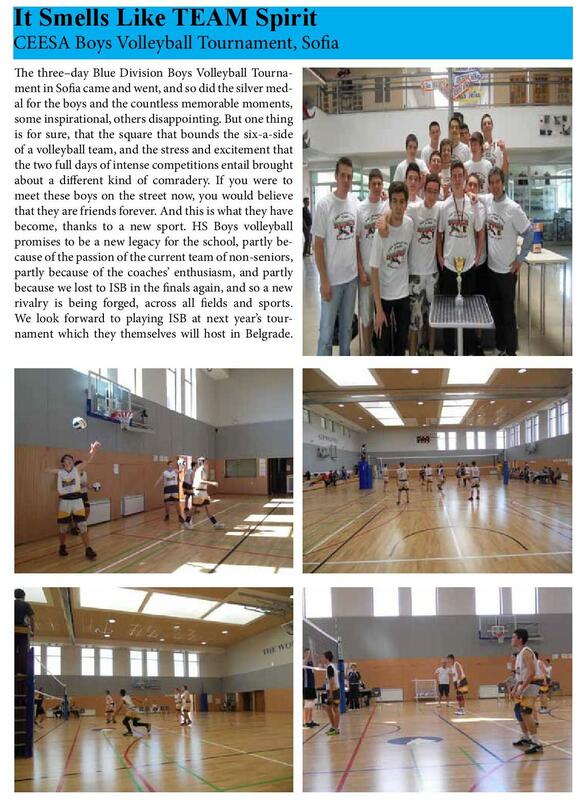 You can watch and support our volleyball team on the following links: http://www.livestream.com/is_belgrade http://www.ustream.tv/channel/international-school-of-belgradeWe wish them the best of luck! We’re very happy to announce that NOVA's MS girls won the 2nd place and Sportsmanship Award at CEESA's Middle School Girls Volleyball Tournament in Riga, Latvia. The team’s hard work, strong will, and cooperation skills make us all proud. Great job, Girls! Our Pre-K 3 and 4 year olds loved seeing the animals up close as they study zoo animals and pets. To follow and support our Middle School girls volleyball team competing against other CEESA international schools in Riga, you can watch a live video feed of the games on the following link: http://www.ustream.tv/channel/ceesa-middle-school-basketball You can look at the schedule of games to see when our girls are playing. Please note that Riga is one hour ahead of Skopje. 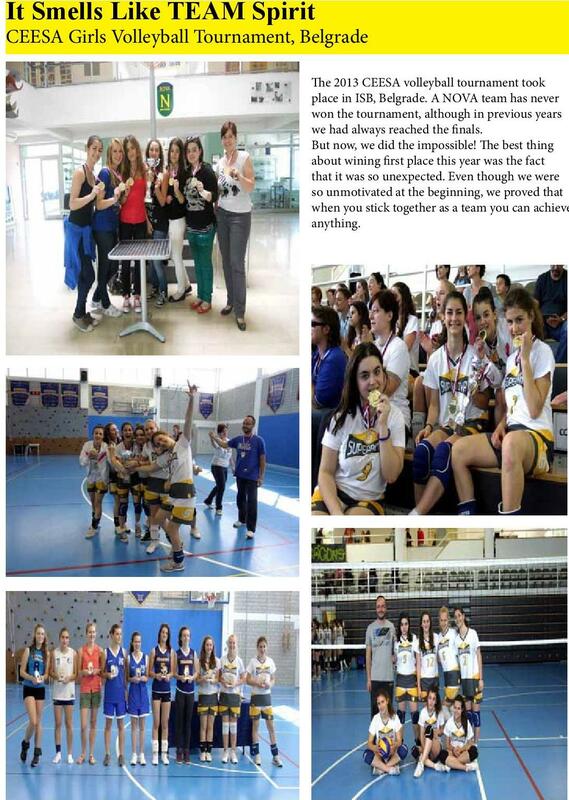 We wish our girls volleyball team all the best! 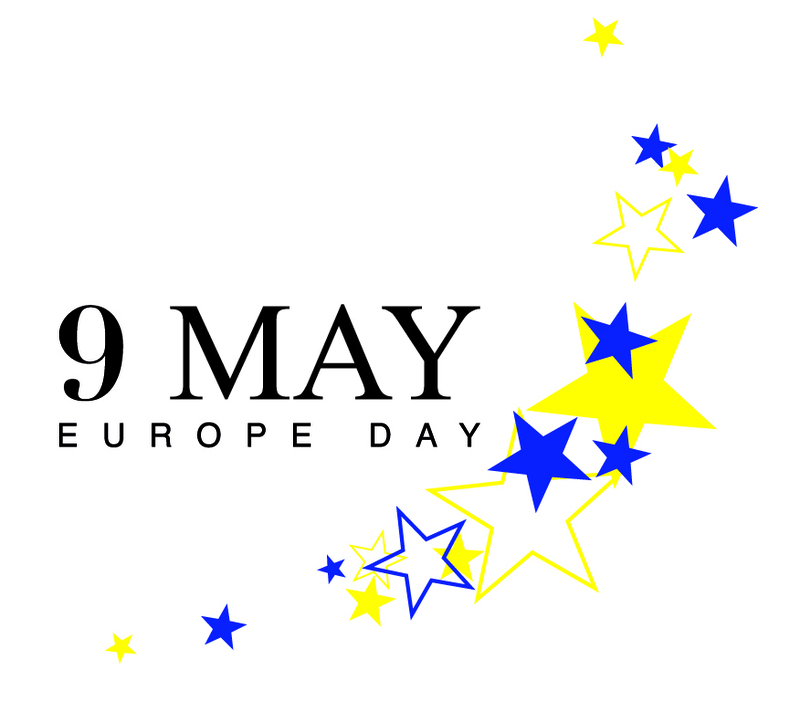 Celebrating Europe day on the 9th of May, the NOVA Model European Parliament (MEP) club is organizing a speech competition. 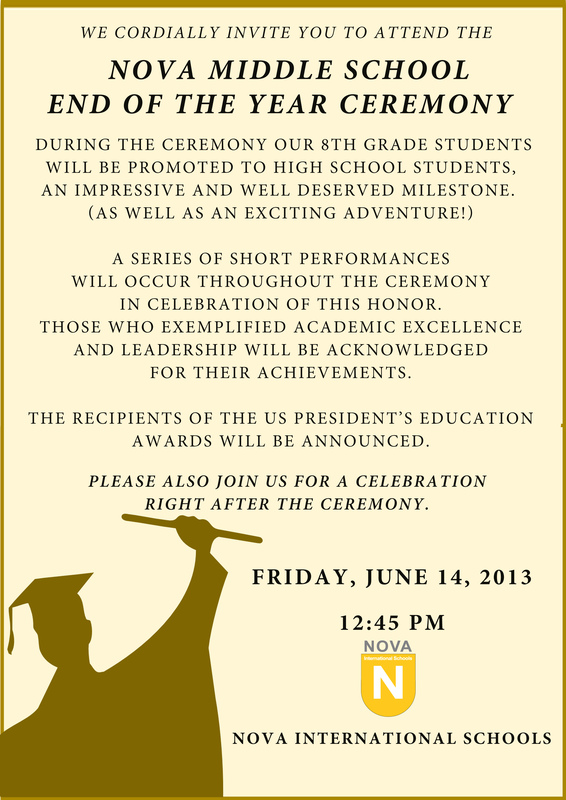 Ten students will be competing, giving speeches on the topic: We believe that the European experiment has succeeded. Selected students from this competition will be representing NOVA High School on the MEP national session in the autumn 2013.The speech competition will begin at 3 pm on the 9th of May in the MS Media room. The event is open for anyone that wishes to attend. The following NOVA students will compete: Ina Dimova, Nikola Danev, Filip Nikolovski, Mishel Mucunska, Kala Netkova, Tijana Istochka, Sergej Grunevski, Mila Georgievska, Ana Arsovska, and Blanka Nakova. 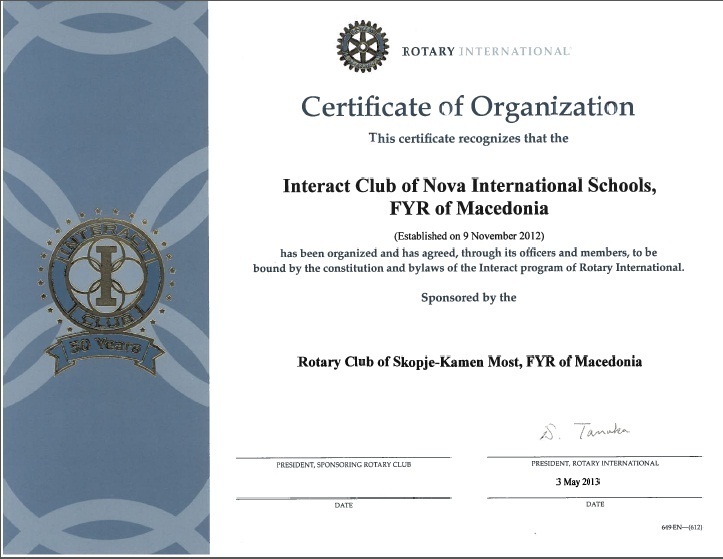 We're happy to report that the Interact club of NOVA International School has been officially chartered by Rotary International. 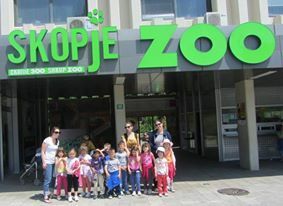 This club is the first of its kind in the Republic of Macedonia, sponsored by the Rotary Club Skopje – Kamen Most. The occasion is all the more momentous when considering it took place at the 50th anniversary of the chartering of the first such club in the US. Congratulations to all of the Interact members for making this club a reality and for paving the way for other high school students around Macedonia to follow suit. Congratulation to Fjolla Zllatku for winning second place on the Italian State Competition held on April 26th. Well done Fjolla. April was Friendship month. At our assembly students performed the classic The Velveteen Rabbit, played cooperation games, shared narratives about their friends, and sang songs. At the end of the day everyone got a balloon that symbolizes how friends fill you up with love and happiness. 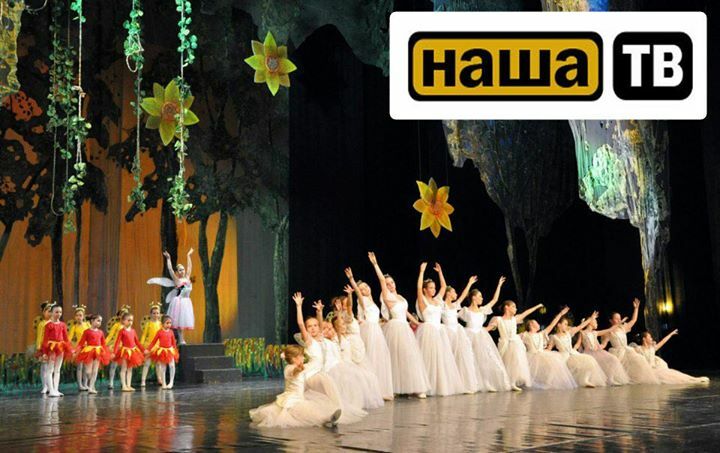 We're proud to announce that this year's Elementary and Middle School Christmas performance " A Forest Fairy Tale" will be aired on Nasa TV during the Easter holidays. It will air on Sunday, May 5th, at 9:30am, 6pm and 10:30pm, and Monday, May 6th, at 9:10am and 6:30pm. We're happy that will be able to showcase the many talents of our students and faculty to the wider community. Our gratitude goes out to Risto Gogovski and the rest of the Nasa TV crew for their support.